I first heard of the project that would become Handy Andy back in 2013 when Joe Niese, the author of the book, found my baseball card blog while doing research and asked if I wanted to add my thoughts on being an Andy Pafko memorabilia and card collector. At the time I was living in Ukraine with my wife and I had nearly completely stopped updating Heartbreaking Cards as I was away from my card collection. I wrote back saying I would write something up when we were back home and I'm not sure exactly what happened next as I must have archived the message because I completely spaced through responding. Joe wrote me again shortly before Handy Andy's successful Kickstarter campaign and I was very excited to see the finished product. and I was eager to learn a lot more about my favorite baseball player. I'm a huge Andy Pafko baseball card collector and it was great learning more about his life before and after his major league career. All told Andy had an amazing baseball career as he was directly involved in some of baseball's most important moments. He was there for the Curse of the Billy Goat, he watched Bobby Thomson's Shot Heard Round The World fly over his head, and he batted in "The Greatest Game Ever Pitched" when Harvey Haddix pitched 12 perfect innings against Pafko's Braves. Through Niese's research I was also happy to discover that Pafko has a claim to the record for the furthest hit home run when one of this dingers actually landed on a passing train and came to rest several hundred miles later! Handy Andy is for any fan of baseball biographies! As a person who regularly writes about baseball, I know it can be difficult to avoid the same old trap in describing action on the field with the same terms again and again. Niese does an excellent job at keeping the game play interesting and not redundant. 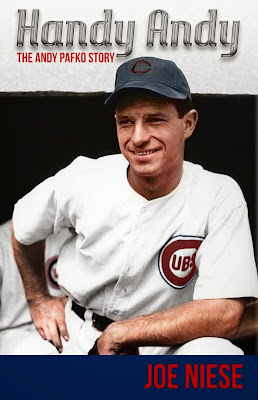 I'm personally interested more at Pafko's time with the Milwaukee Braves but Niese was able to keep my interest during the chapters chronically his minor league seasons and Chicago Cubs tenure. I consider myself a Pafko expert when it comes to his appearances on baseball cards but there was a lot I did not know about his playing days. My interest in Pafko's career stems from his growing up a small distance from my hometown so it was interesting to find another connection now that I'm living down in Georgia. During Pafko's minor league career his first team located outside of Wisconsin was from Macon, Georgia and called The Peaches. They were a part of the South Atlantic League and it seemed that Andy didn't enjoy his time in Georgia too much as he was home sick. One of the great parts of being a Pafko collector and reading Handy Andy is that I would read a particular anecdote and take a look in my collection for that piece mentioned. 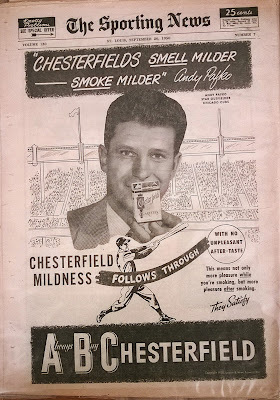 For example, the book briefly mentions that Pafko was a spokesman for Chesterfield Cigarettes and I had just recently picked up an old issue The Sporting News with Andy featured on a full paged add for Chesterfields. 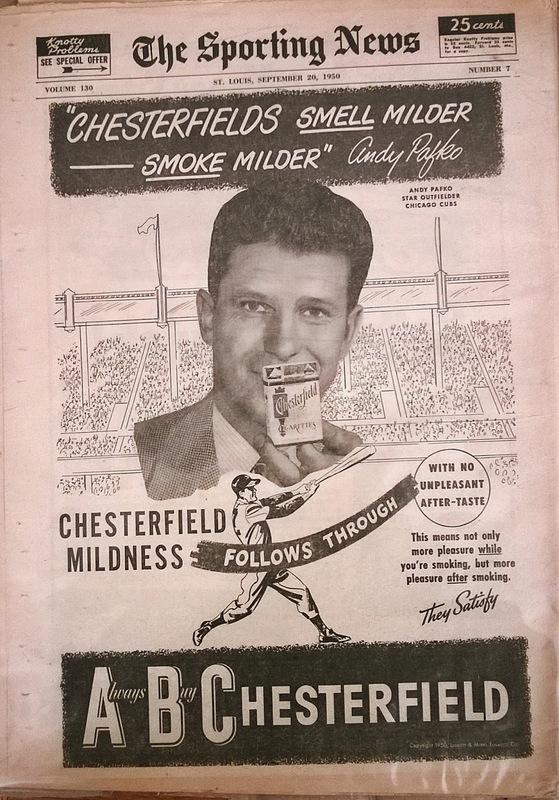 It is funny to think with Pafko's mild mannered reputation that he was a spokesman for cigarettes. My how our perceptions have changed on that product. 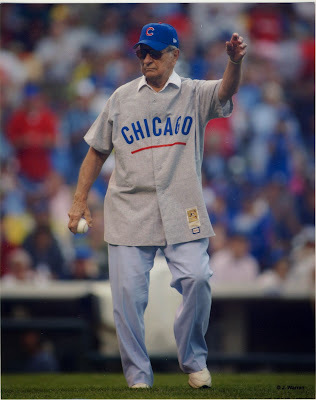 Another example comes in the chapter chronically Andy's post-retirement career as it mentions that he threw out the first pitch at Wrigley Field on August 25, 2004. This provided me with an answer to the origin of this great 8x10 photo I picked up of Pafko with aviator shades and a ball in his hand. As I hope you can tell I highly recommend this book not only because it's about my favorite baseball player but because it is an interesting well-written baseball biography. In the near future I'm going to continue to promote Handy Andy through a series of posts highlighting baseball cards of some Pafko's teammates mentioned throughout the book. Until then please consider picking up a copy of Handy Andy through the author's web page or through Amazon.